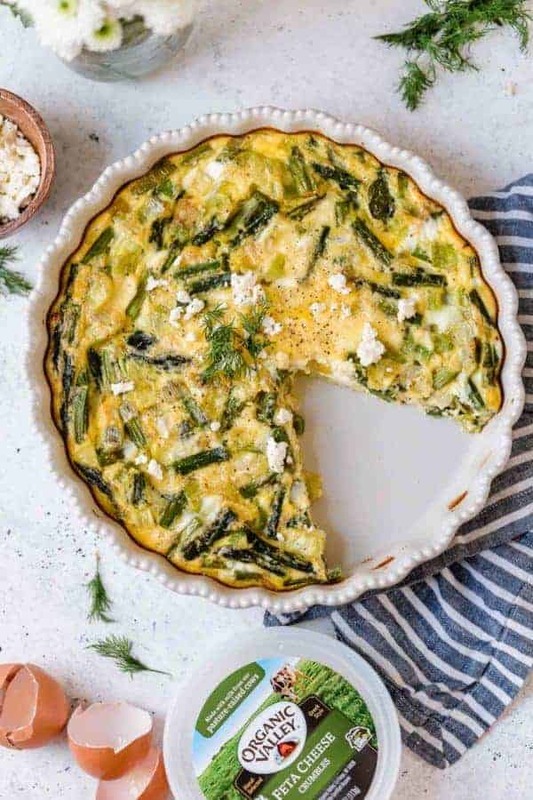 A perfect addition to your springtime breakfast or brunch menu, this Crustless Asparagus, Leek & Feta Quiche is a scrumptious, veggie-loaded egg dish that’s quick to make and full of flavor. 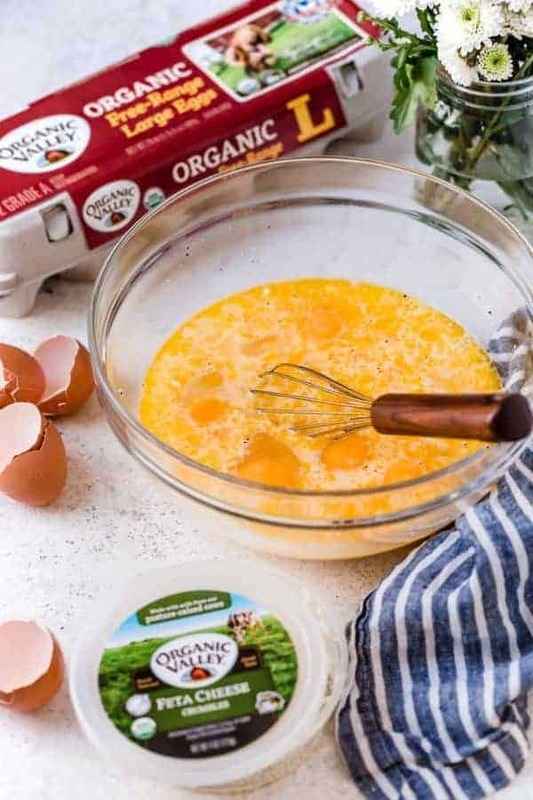 This recipe was created in partnership with our friends at Organic Valley. Gather friends and family around the table and serve this Crustless Asparagus, Leek & Feta Quiche. 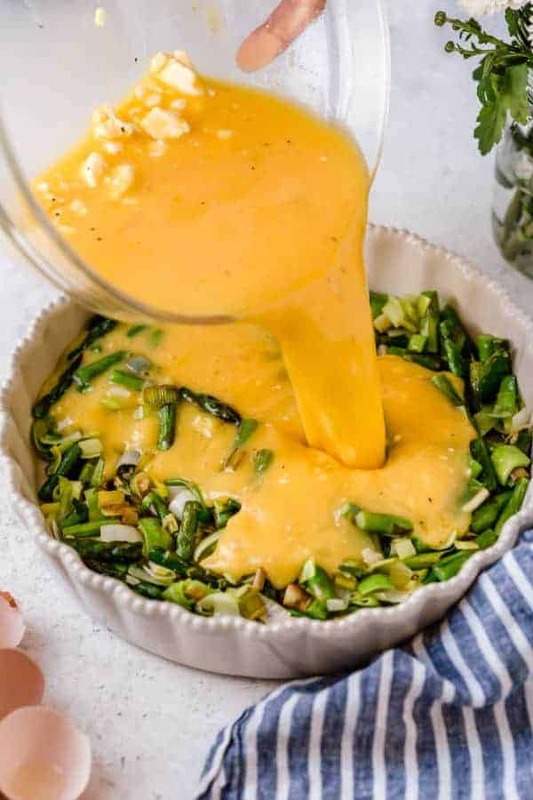 This recipe will truly make the perfect addition to a special occasion, springtime breakfast or brunch such as Easter, Mother’s Day, a spring birthday, a bridal or baby shower, or a Sunday gathering with family. To complete the menu, serve it with our Blackberry Sage Breakfast Patties, a spring salad tossed in Citrus Vinaigrette with Thyme and a fresh fruit salad. Asparagus and leeks pair perfectly in this spring-inspired quiche. Soon asparagus will be growing abundantly in backyards and will be readily available at grocery stores and Farmers’ Markets. After this snowy and cold winter, I’m definitely looking forward to spring and all the seasonal and locally grown produce that comes with it like asparagus, leeks, greens, radishes and fresh herbs to name a few. I’m so excited to starting cooking with all of these foods. Also, a big thanks to my husbands’ relatives who started an asparagus patch several years ago on the century farm we live on. Now we get to enjoy it in abundance, too! 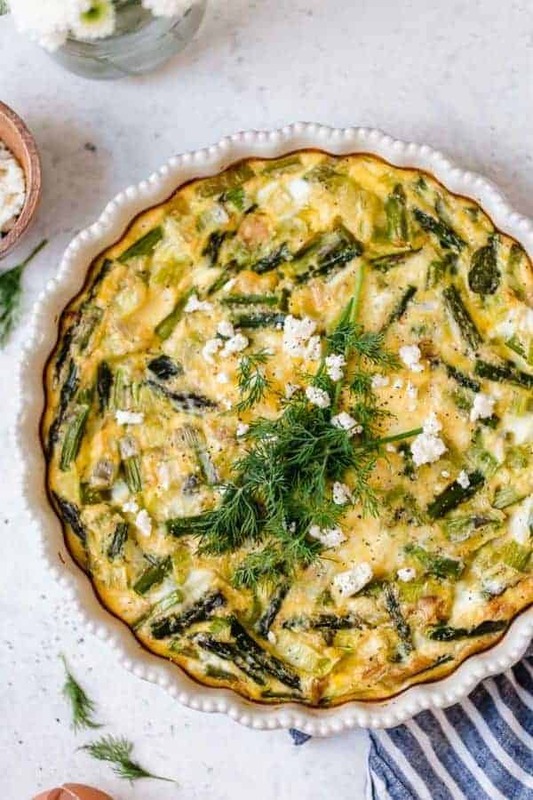 Just 6 ingredients (not including ghee/butter, salt & pepper) is all you need to make this Crustless Asparagus, Leek & Feta Quiche. 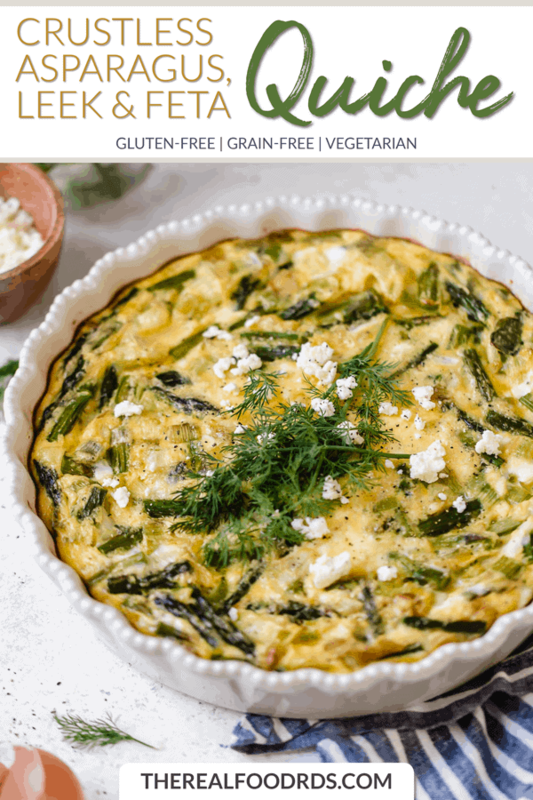 The combination of 6 simple ingredients in this Crustless Asparagus, Leek & Feta Quiche creates a delightful and scrumptious flavor. 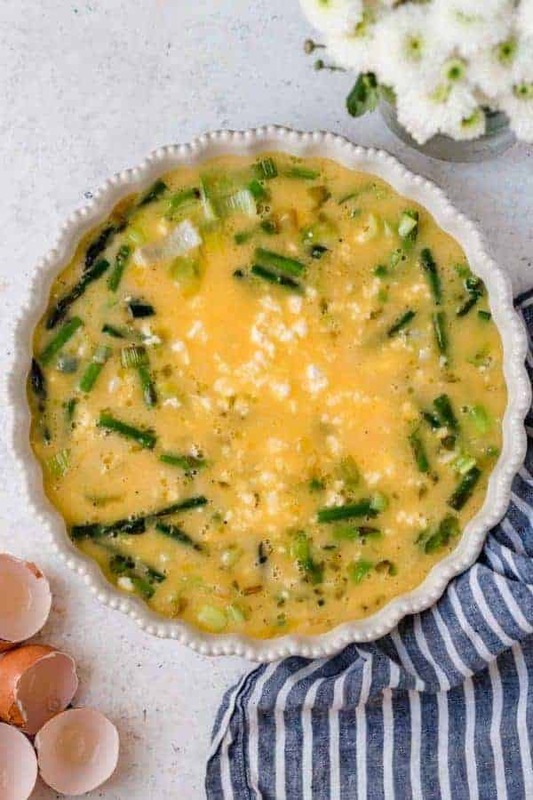 With every bite, you will enjoy perfect forkfuls of asparagus, leeks, garlic, Organic Valley Feta and Organic Valley Eggs. And while it’s totally optional, I love adding fresh herbs for another dimension of flavor. Dill, chives, or parsley would all make a nice addition to this recipe. 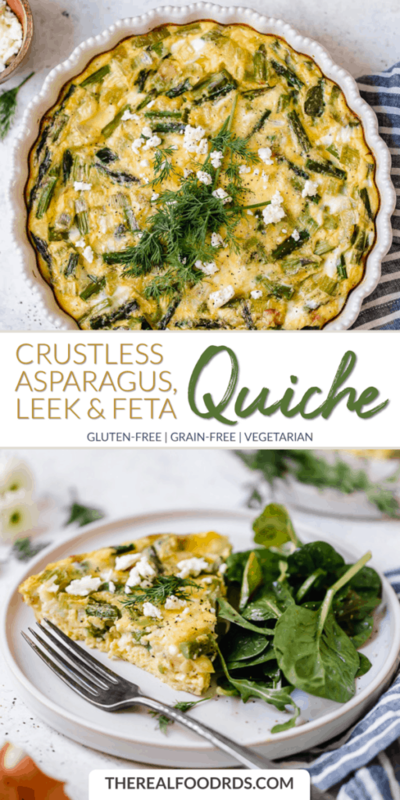 Best of all, Crustless Asparagus, Leek & Feta Quiche is quick to make! I’m not one who loves spending hours upon hours in the kitchen cooking a meal and my guess is you aren’t either – especially when the weather begins to turn nice and spring is in the air. So my mission will always be to create recipes for you that are simple, healthy, and delicious. This recipe fits the bill with only 15-20 minutes of prep time required. This is an important step that not only helps to combine all of the delicious flavors, but it also ensures that the veggies are done to perfection and not undercooked. This is a step I take with almost all of the veggie-filled, egg-dishes that I make to avoid the chances of taking a bite into overly crunchy veggies. No worries! You won’t even miss the crust. While I do enjoy a buttery, flakey crust with traditional quiches. 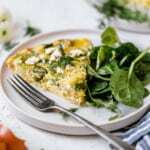 I decided skip the crust so that I could shorten the ingredient list as well as the prep time (more time outside) and create a lower-carb breakfast option without impeding on the flavor. Lo and behold, you won’t even miss the crust! Now if you want to make this recipe a bit more “meaty,” you could certainly add a little Organic Prairie ham, sausage or chopped bacon. And if feta cheese isn’t your thing, there’s always cheddar, mozzarella or Swiss cheese that will work as a tasty substitute. Quality dairy truly does matter – for our health, the animals, the farmers and the environment. Read more about why we choose organic dairy in this post. 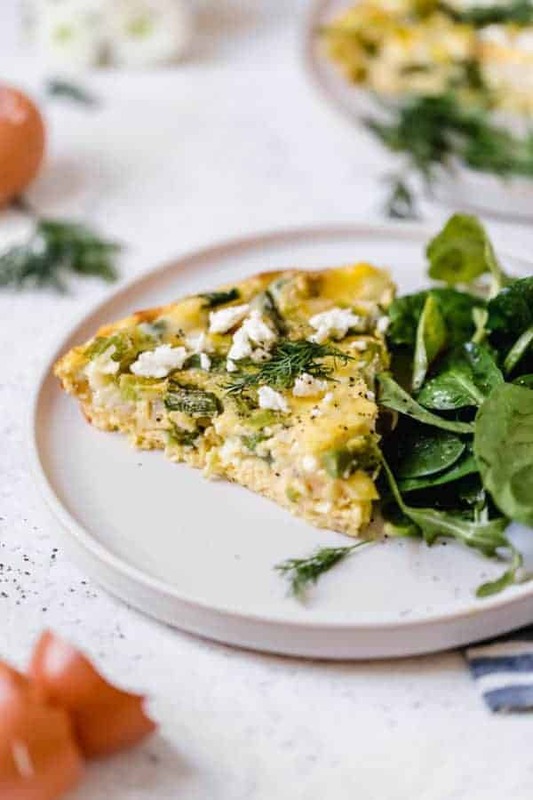 Serve Crustless Asparagus, Leek & Feta Quiche along side of our Blackberry Sage Breakfast Sausage to make a beautiful and tasty springtime breakfast or brunch. This post was made possible by our friends at Organic Valley. Although we received compensation for this post, the opinions expressed here are – as always – 100% our own. Thank you for supporting the great companies we work with thereby allowing us to continue creating great recipes and content for you.